Myerson was commissioned by two academics in Facilities Management (FM), Professors Keith Alexander (University of Salford) and Ilfryn Price (Sheffield Business School), to contribute to a peer-reviewed book in the Routledge Studies in Innovation, Organizations and Technology series. The publication critically repositioned the FM discipline within the field of human ecology, viewing the office not as an art, technical or investment object but as a social construct shaped by its users. Myerson explored this idea of organisational ecology by examining the design strategies adopted by large organisations seeking to be more innovative in a competitive global economy. The research re-examined and classified 130 international office-design case studies, written up by Myerson and Philip Ross in a trilogy of books for Laurence King (The Creative Office, 1999, The 21st Century Office, 2003 and Space to Work, 2006) in the context of managing the ‘fuzzy front end’ of the innovation process. 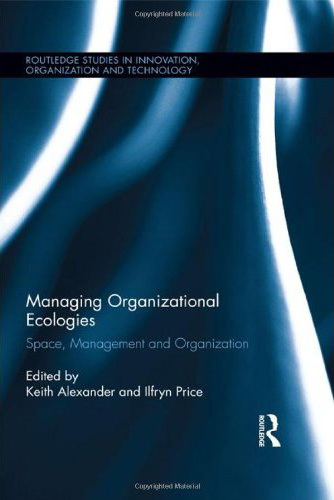 By cross-referencing the characteristics of new office schemes over a decade (1998–2008) against the principles of front-end innovation as discussed by such management thinkers as Kim and Mauborgne, Christensen, Von Hippel and Chesbrough, the research defines the emergence of some new organisational ecologies and transformation of others. Significantly, Myerson’s chapter enhances the role of design within FM theory and builds on a peer-reviewed journal paper 'Space for thought: Designing for knowledge workers', Facilities, vol. 29 (Greene and Myerson 2011), which was commissioned by Dr Barry Haynes of Sheffield Hallam University, a contributor to the book, and won an Outstanding Paper Award from Emerald Publishing (2012). Myerson gave lectures on his approach to FM at Sheffield Business School (2011) and at a New Ways of Working seminar in Helsinki (Finnish Ministry of Technology/Aalto University, 2012). He also gave the academic address at the Front End of Innovation Conference (Zurich, 2012).